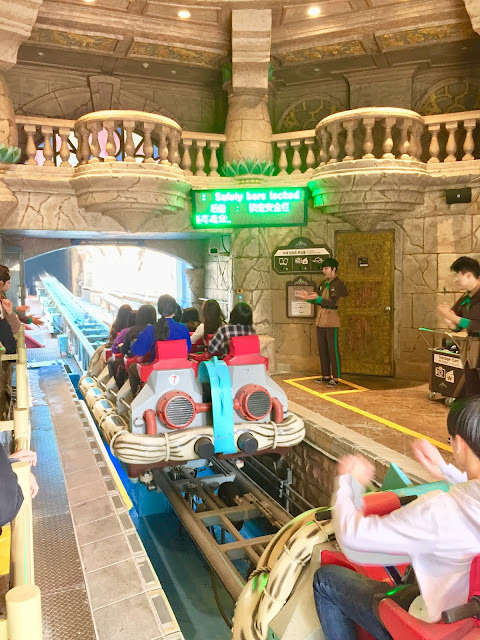 In Lotte World in Seoul, South Korea, there is a roller coaster that everyone always runs towards to once the theme park opens. It's without doubt the star attraction of the park, possessing line that is constantly more than 90 minutes long even on a normal weekday. The launch, the quickly changing turns and layout, as well as its theming aren't the only things that make this a roller coaster to pay attention to. This is Atlantis Adventure. As of today, it's the world's only Intamin Aqua Trax roller coaster. Joy and terror: guests skip through the water on Atlantis Adventure. There's no doubt that the exterior of this roller coaster would make guests passing by stop and be awed by the sight of the coaster carts moving in and out of the intricately Atlantis-themed castle that houses Atlantis Adventure. 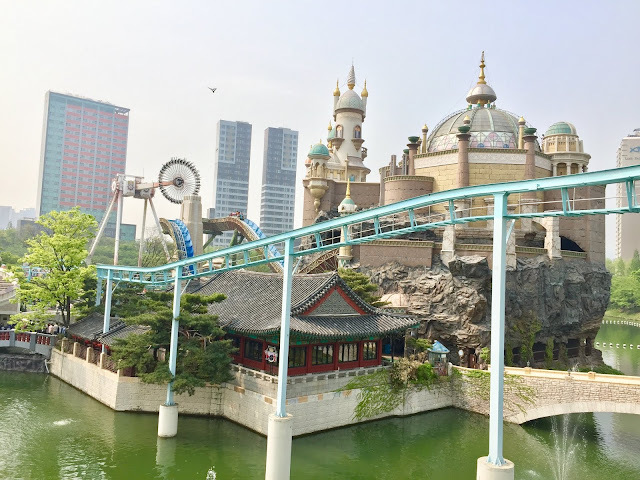 The launch, the intensity, and the impeccable theming of this 'petite' roller coaster makes it a must-go while at the park and - in fact - makes Lotte World worth a visit. But if it's such a good coaster, why is there only one of its kind in the world? Why don't other theme parks follow suit and actually get a roller coaster like this? Guests waiting for their turns to ride Atlantis Adventure, without doubt the park's most popular attraction. According to Intamin's website, the company behind the roller coaster, an Aqua Trax is "a family thrill type roller coasters featuring water effects and elements." Often times, this caused confusion among theme park and roller coaster enthusiasts worldwide who have never experienced an Aqua Trax before. Many think that an Aqua Trax is the same as a typical water coaster such as this and this (both of which are created by a minor competitor, Mack Rides). A rider touched the surface of the Atlantis Lake on Atlantis Adventure, soaking the guest behind him. The truth can't be any more different than that: whereas a water coaster actually gets its riders wet - sometimes soaked - by plunging them into a large body of water, an Aqua Trax never touches the surface of a water body. Rather, it comes very close into contact with it, giving the most daring riders the chance to glide their hands along the surface for that 'jet ski' sensation. In addition, water is poured onto particular portions of the track itself rather than submerging the entire track inside the water. Atlantis Adventure's first major drop and its water effects. Atlantis Adventure is known for a tragedy back in March 2006, just 2.5 years after its opening. A 28-year-old South Korean man fell to his death caused by the rider riding while under the influence of alcohol and securing the restrain in a proper manner. While riders should bear the responsibility for riding while sober, the fact that the ride operators didn't check properly hit Lotte World's reputation real hard. 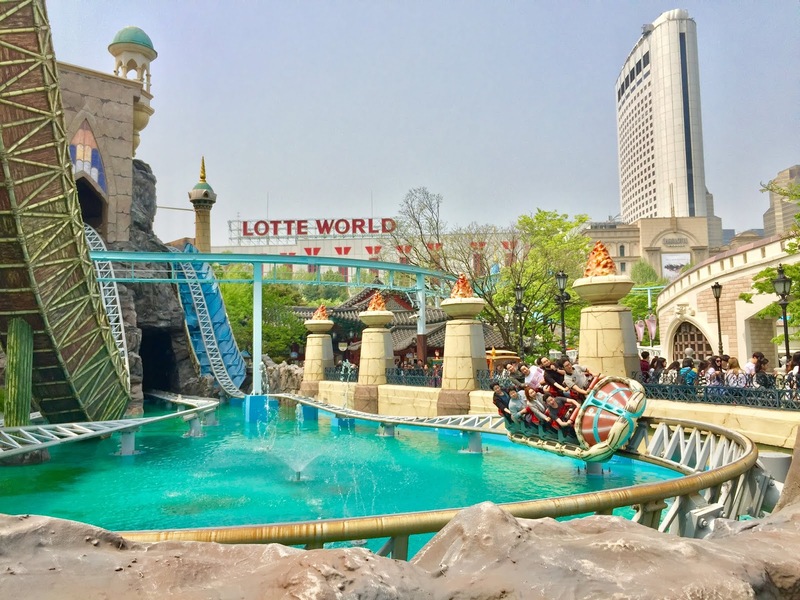 In an attempt to fix their broken reputation, Lotte World held a six-day free-admission promotion period, which unfortunately resulted in further chaos as a stampede injured 24 guests. Needless to say, the promotion period was immediately cancelled. 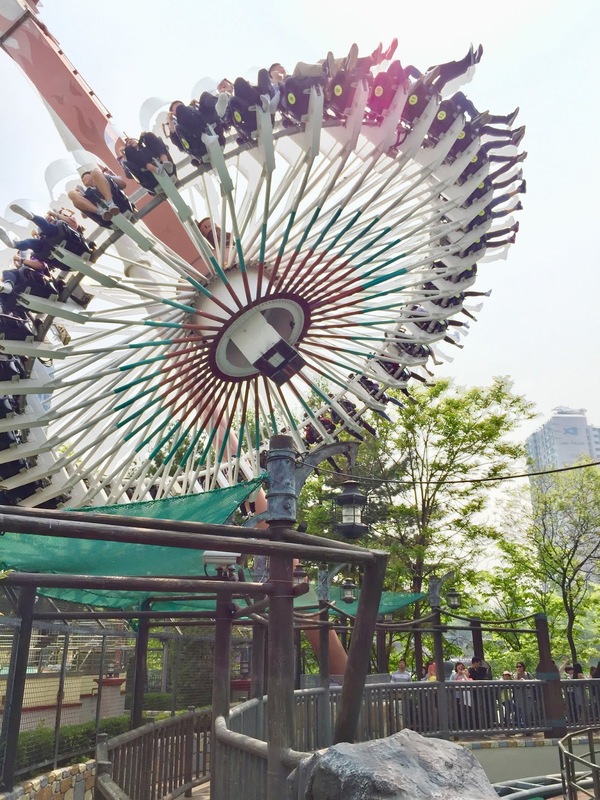 The accident didn't deter many visitors from experiencing this one-of-a-kind roller coaster. 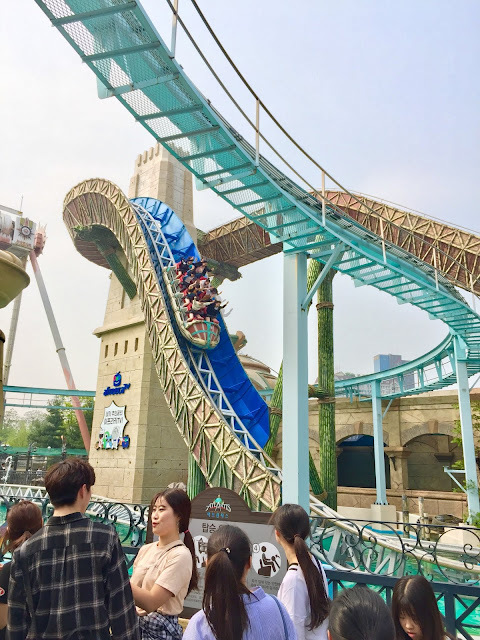 After all, Lotte World can be proud for having the world's only Intamin Aqua Trax, which in itself is a damn good coaster. So if it's that good, why would no other parks around the world build this model? 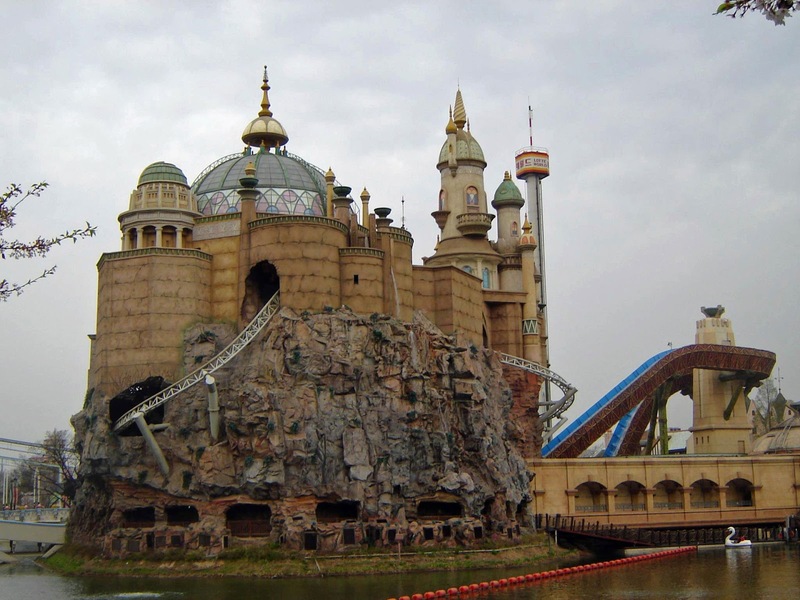 Atlantis Adventure is housed within this highly-themed structure, designed after an Atlantic Empire. Want to feel that splash of water in your face right away? Click here now. To fully appreciate Atlantis Adventure, one must carefully look at the theming work that has been done to the sceneries that house the roller coaster. As the guests enter the queue, they'll be able to look over the Atlantis Lake more clearly. This is the lake where Atlantis Adventure plunges its riders onto twice throughout the course of the ride. Atlantis Adventure's queue goes below the pendulum ride next door. The riders then enter the station housed within the castle structure. This is where the theming starts to show its full potential. Impeccably designed and beautifully structured, the theming of the station somewhat resembles that of Atlantica Supersplash: brown- and aqua-hued ornaments are scattered across the interior creating illusion of the station being old and underwater for a long time. Atlantis Adventure's well-themed station holds two trains at the same time. Thanks to the small-sized trains of this coaster model, Atlantis Adventure's station holds 2 trains, making it possible to load and unload 16 guests at a time. I found the loading/unloading process for this attraction is unique. Riders with carry-ons go on the train and simply sit as the staffs actually come to you with carts to hold your belongings. This significantly improves the loading process. Throughout the day, I got to ride this coaster 3 times and each time, they needed only around 45 seconds to dispatch the pair of trains, which is an amazing feat given the unusual trains. Riders waiting to be launched 0 - 46.6 mph in just 1.5 seconds. The train rolls out of the station slowly and goes directly onto the launch track. Guests accelerate from 0 to 46.6 mph in 1.5 seconds - metric readers, ~75 kph. Having been on many much-faster roller coasters, I found this launch to be on the tamer side. Nevertheless, a launch remains exciting no matter what. The train reaches the top speed and enters the main castle. In the darkness, riders all of a sudden climb a huge top hat that has a maximum inclination of 85 degrees. First-time riders will be caught off-guard by the huge force this exerts on the riders. It also doesn't help that this element is fully enclosed and out-of-view from guests passing by the attractions. This top hat makes Atlantis Adventure one of those roller coasters that goes from zero to climax in just a matter of split seconds. 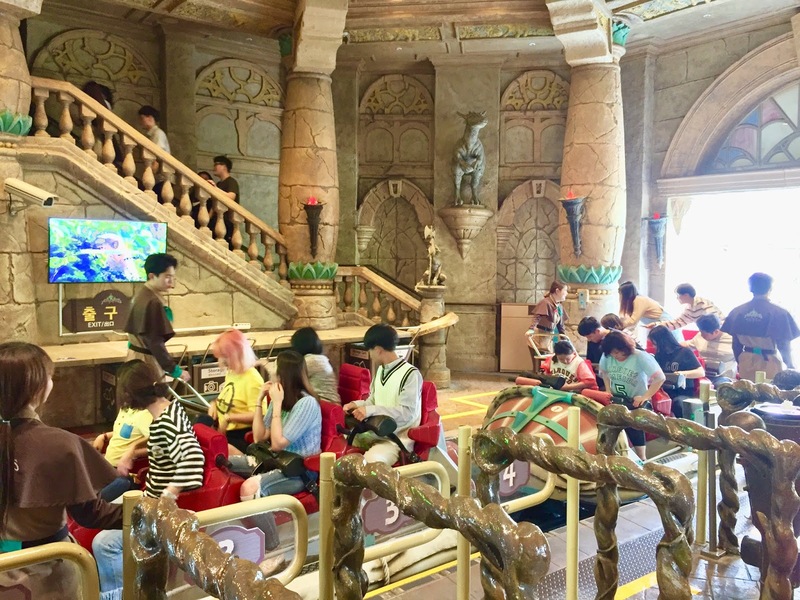 The complex layout, combined with the intricately-themed castle structure, makes Atlantis Adventure a roller coaster that is as pleasant to look at as to ride. Following the top hat, Atlantis Adventure brings its riders through tight and quickly-changing turns in and out of the castle. 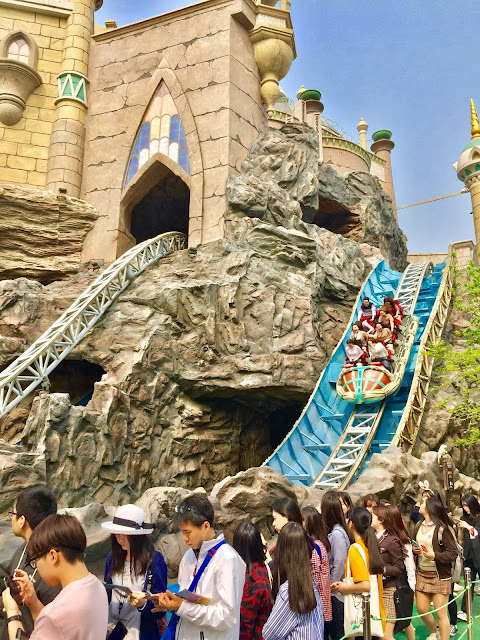 Despite the fact that the main castle structure is impeccably themed - both inside and outside - riders are unable to enjoy the beauty of it for too long given the quick pace of the ride. As they go through 2 quick turns, the train finally goes outside and around the castle vicinity. From here, the train plunges directly to its first major drop, which can be viewed by all guests outside. This is the first point in which this Aqua Trax shows its unique water effects. With water effects sprayed onto the drop track, riders have the chance to get wet as their train hits the water. Atlantis Adventure brings its riders really close to the surface of Atlantis Lake. The train hits a small bump at the bottom of the drop to simulate a boat that just crashes onto the water. This is followed by an exciting part of the coaster: a tightly, almost vertically banked right turn back to the castle structure. 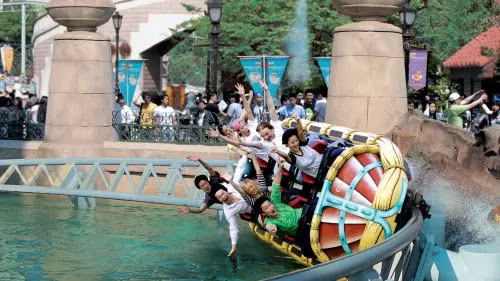 Guests who ride on the right side of the roller coaster actually have the option to extend their right arms to touch the surface of the lake and create a jet-ski effect that will leave the guests in the back rows soaked. Guests then hit a brake and enters the cave, coming face-to-face with the Atlantis creatures that have seemingly killed many who dare to come near it. Animatronic-wise, I found them to be standard, not really up to Disney-standard. Still, this terrifies quite a few children. The sound effects that day were also unnecessarily loud, scaring the kids even more. Atlantis Adventure's second major drop, even bigger than the first one. 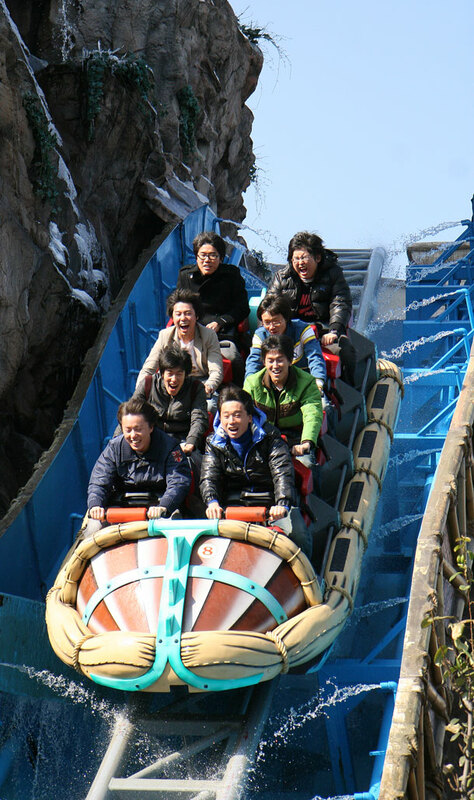 The train makes a 180-degree turn in the cave and before too long, the rider hits a magnetic lift hill. 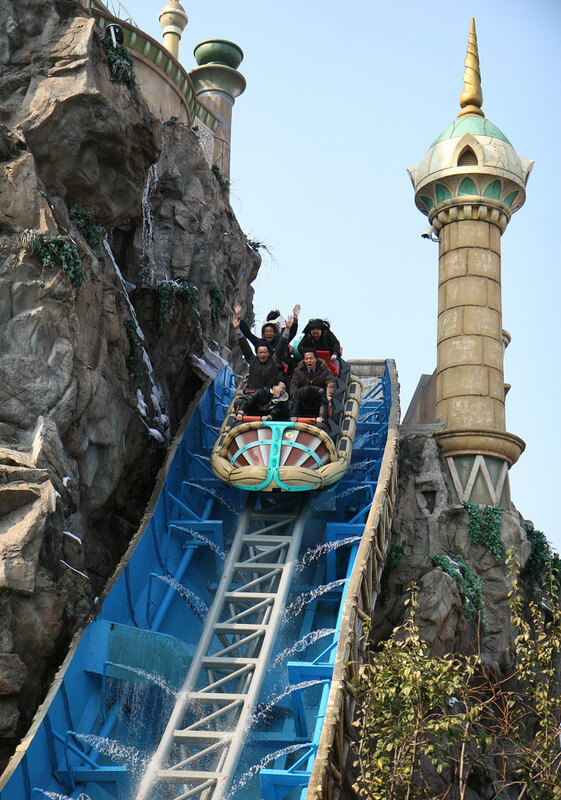 Slowly going up, riders get the chance to take their breath and look around and witness Lotte World below them. If the pendulum ride next to Atlantis Adventure happens to be in cycle, you'll witness another unusual sight of the ride seemingly about to crush you at the top. 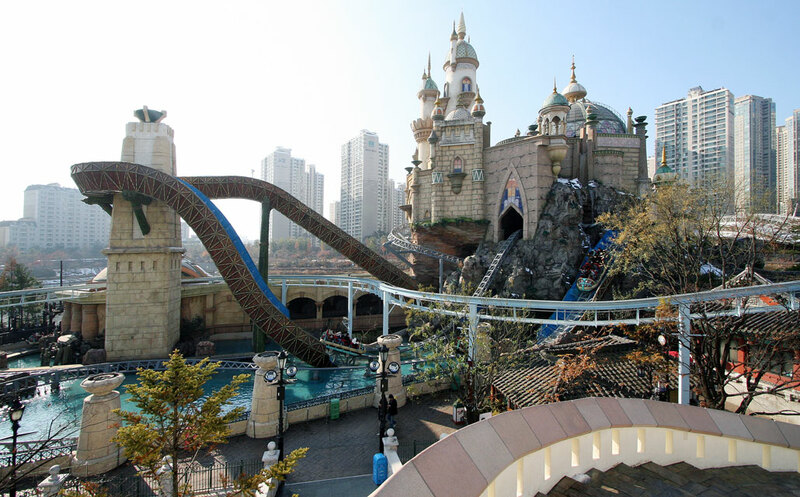 This is when you begin to realise how tightly packed Lotte World is. At the top, riders take another 180-degree left turn before plunging down a bigger, second major drop, complete with its own water effects. This time, riders are then sent back up right away directly onto an airtime hill that plunges them into the darkness of the castle. Inside complete darkness, riders go through a couple of quick twists and turns before hitting another airtime hill towards the outside. After all of that, the riders finally hit the brakes and that's where the ride technically ends. 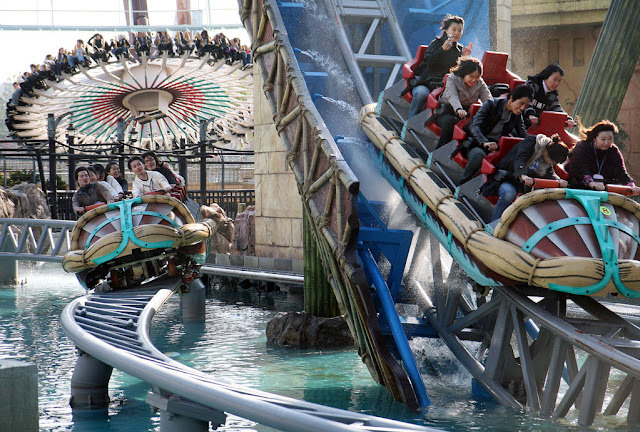 Atlantis Adventure as seen from the bridge that connects Lotte World's indoor and outdoor section. While not holding any world records whatsoever, Atlantis Adventure can pride itself for being the world's only Aqua Trax roller coaster. Its relatively compact size doesn't deter itself from bringing ultimate thrills to the guests. The fully enclosed top hat is surprisingly intense thanks to the open-feel of the train's restraints... and that's just the beginning. The tight and quick turns throughout the rides surprisingly pack a lot of force. The first time I rode it, I didn't prepare myself for that! I lifted my hands up during the launch and when I entered the first turn, my body was thrown sideways so much I can feel slight pain on the right side of my body. I immediately put my hands on the restraints again and gripped them until the train reached the first drop outside. 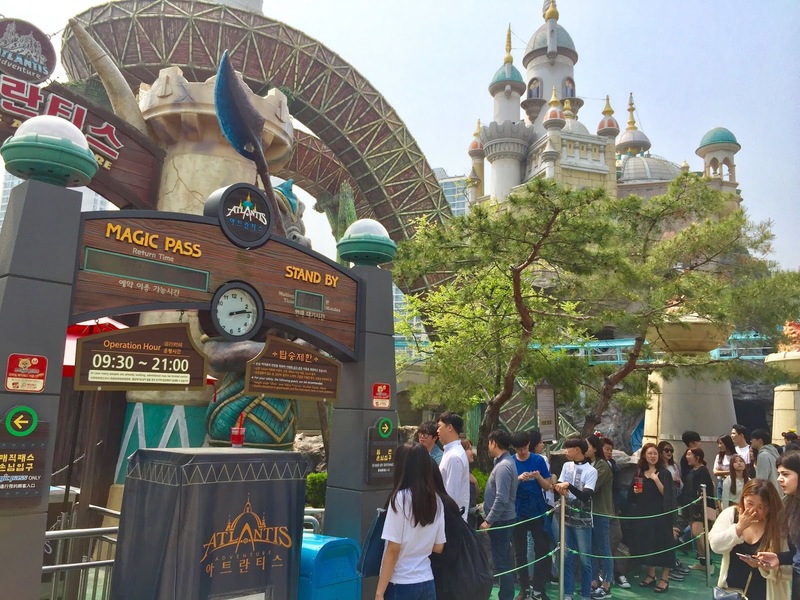 Lotte World goes all-out on the theming for Atlantis Adventure. Atlantis Adventure can also be proud for its extensive theming. The castle exterior is simply beautiful. 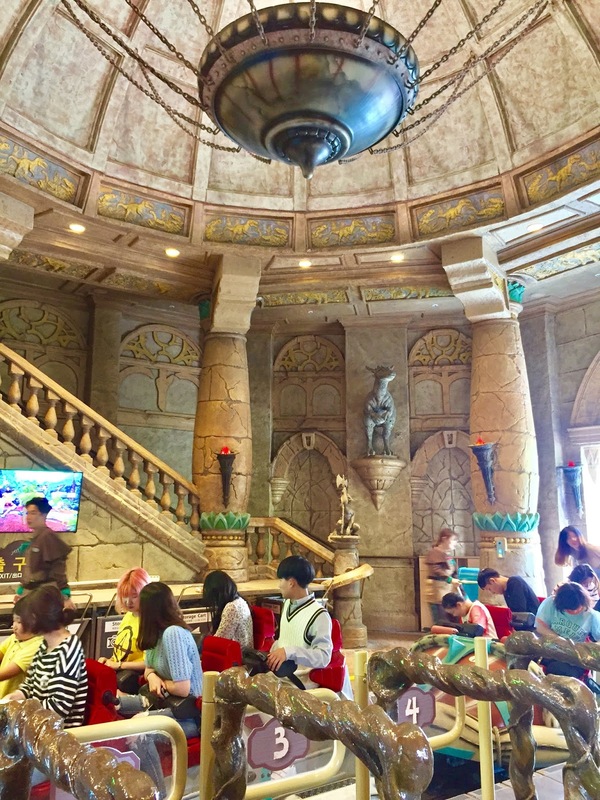 Yet, Lotte World take that to the next level by fully theming the interior of the castle as well. Unfortunately, riders are unable to fully appreciate the intricate theming inside due to minimum lighting as well as the quick pace of the ride. All in all, Atlantis Adventure is a hugely successful addition to Lotte World, and it's one hell of a great roller coaster. Thanks to its open restraints, immersive theming, and unique elements, this is a roller coaster that has to be experienced on your own. In fact, in the latest global poll of 'World's Best Roller Coasters,' the roller coaster came at 31st place, an impressive feat considering the stats of the coaster. If this roller coaster is that good, then how come there's only one of this model in the entire world? Atlantis Adventure's train is physically restrictive, which might be challenging for larger guests. Firstly, the small train. Perhaps because of the tight turns and quickly changing elevation throughout the park, the roller coaster has to make its trains smaller than those on typical roller coasters in the Western region. According to Richard Bannister, the body height limit for riders on Atlantis Adventure is around 6'2" (187 cm), which is terrifyingly low. Understandably, this is out of safety concerns due to the tunnels with low clearance that can be found throughout the ride. Bannister further adds that even for those who are 5'9" (175 cm), the seats are actually pretty cramped. Thankfully, I'm 5'8" (173 cm), so I have plenty of space. I can understand that with this height limit, this wouldn't be a feasible investment for theme parks in the Western regions, where its people are physically bigger. This article, for example, states that the average height for Dutch men is 182.5 cm, which is just slightly below Atlantis Adventure's height limit. Having this model at this park would alienate a lot of customers in this region. 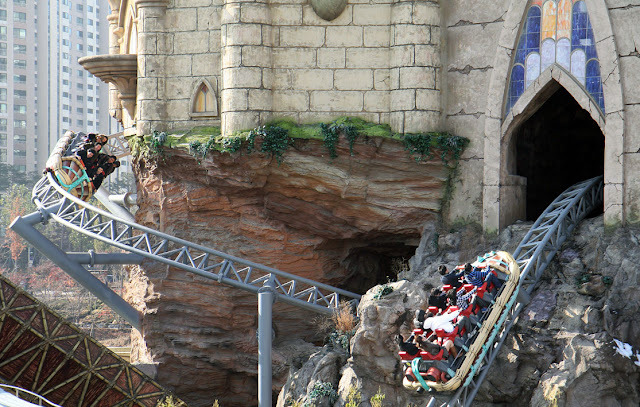 Atlantis Adventure's small trains enable them to go through tight turns and layout. Secondly, I'm not sure if this is true, but I have a feeling that an Aqua Trax is NOT a cheap roller coaster to invest in. The combination of its water effects, magnetic lift and brakes, as well as intricate theming makes this a pricey roller coaster to both build (capital investment) and maintain (operational expense). It doesn't help that an Aqua Trax isn't necessarily a massive coaster, which from public relations and marketing perspectives can be quite challenging to attract visitors. These conditions might - unfortunately - leave Aqua Trax in the dust. Atlantis Adventure is the park's most popular attraction with lines that often extend out of its queue line. Atlantis Adventure is a great roller coaster, and Lotte World should be proud for having the world's only Aqua Trax roller coaster. Its tight turns, shocking top hat, water effects, and impressive theming make it a unique roller coaster that creates experience unlike any other. 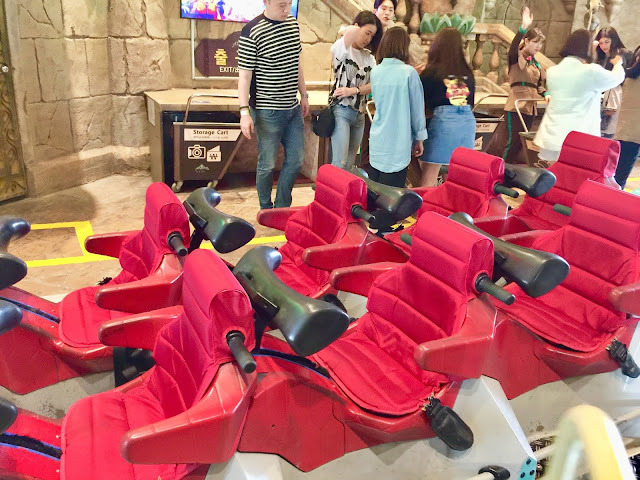 The restraints, while physically restrictive, give free and open feeling to the riders, making them feel more vulnerable to the quick pace of the ride. It's unfortunate that Aqua Trax isn't an economically feasible investment for many theme parks worldwide. Its physical restrictions make it hard for the model to universally cater to general Western visitors or larger guests. Additionally, Aqua Trax is more challenging to market and impress. Understandably, theme parks would like to spend their money elsewhere. Atlantis Adventure in all of its glory is a sight to witness. Regardless, Atlantis Adventure should be in your bucket list of 'roller coasters to ride.' Until other parks decide to build a similar model, pack your bags, get your tickets to Seoul, head directly to Lotte World, and sprint to this roller coaster immediately. Eventually Aqua Trax evolves into the Blitz Coaster that we know today as well as the family launch coaster with similar seating style. They bang bigger for the investment that parks are willing to do.